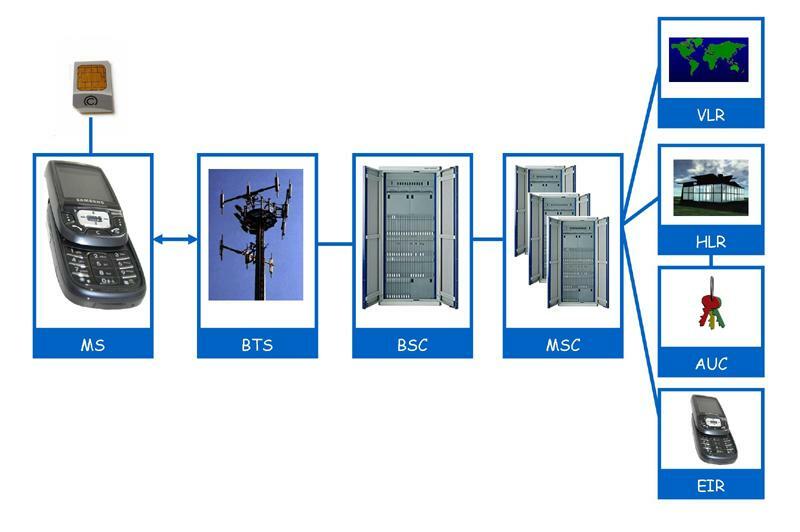 What is HLR and VLR and its function in GSM in telecom, temporary mobile subscriber identity tmsi, mobile station roaming number msrn, location area identity in vlr. in simple HLR having all the detail of customer and VLR having same but just regular use of detail of calling and sms related. As From the Name VLR means Visitor Location Register and HLR means Home Location Register so it has all detail of subscriber so VLR has temporary details. Let’s check in detail vlr in telecom. The HLR in telecom is the reference database for subscriber parameters. Actually HLR Having all the detail like customer ID, customer number, billing detail and for prepaid with IN intelligent network its has detail of current recharge of prepaid user so far its is very complex but i just make it in simple word for you. Various identification numbers and addresses are stored, as well as authentication parameters. This information is entered into the database by the network provider when a new subscriber is added to the system. The HLR in telecom database contains the master database of all the subscribers to a GSM PLMN. The data it contains is remotely accessed by all the MSCs and the VLRs in the network and, although the network may contain more than one HLR, there is only one database record per subscriber – each HLR is therefore handling a portion of the total subscriber database. The subscriber data may be accessed by either the IMSI or the MSISDN number. The data can also be accessed by an MSC or a VLR in a different PLMN, to allow inter-system and inter-country roaming. The VLR contains a copy of most of the data stored at the HLR. It is, however, temporary data which exists for only as long as the subscriber is “active” in the particular area covered by the VLR. The VLR provides a local database for the subscribers wherever they are physically located within a PLMN, this may or may not be the “home” system. This function eliminates the need for excessive and time-consuming references to the “home” HLR database. Temporary Mobile Subscriber Identity (TMSI). Mobile Station Roaming Number (MSRN). Mobile status (busy/free/no answer etc.). Cells within the Public Land Mobile Network (PLMN) are grouped together into geographical areas. Each area is assigned a Location Area Identity (LAI), a location area may typically contain 30 cells. Each VLR controls several LAIs and as a subscriber moves from one LAI to another, the LAI is updated in the VLR. As the subscriber moves from one VLR to another, the VLR address is updated at the HLR. The VLR controls the allocation of new Temporary Mobile Subscriber Identity (TMSI) numbers and notifies them to the HLR. The TMSI will be updated frequently, this makes it very difficult for the call to be traced and therefore provides a high degree of security for the subscriber. On entry to a new LAI. On entry to a new VLR. As a subscriber may wish to operate outside its “home” system at some time, the VLR can also allocate a Mobile Station Roaming Number (MSRN). This number is assigned from a list of numbers held at the VLR (MSC). The MSRN is then used to route the call to the MSC which controls the base station in the MSs Current location. 26 queries in 0.374 seconds.